We first discovered this gorgeous and uplifting poem thanks to Ms Espinasse’s email blast and couldn’t resist sharing. Enjoy! Raoul Follereau (1902-1977), who established World Leprosy day and who, throughout his life, shared his compassion for victims of leprosy–as well as for victims of poverty, indifference, and injustice. Every corner offers a new view to take your breath away. You can’t help but smile! Sans appauvrir ceux qui le donnent. without impoverishing the one who gives it. Mais son souvenir est parfois éternel. But sometimes its memory lasts forever. Sharing a meal with friends underneath the beautiful Provencal sun is such a treat! Personne n’est assez pauvre pour ne pas le mériter. Nobody is poor enough to not deserve it. Il est le signe sensible de l’amitié. It is the visible sign of friendship. Un sourire donne du repos à l’être fatigué. A smile brings rest to the weary soul. Suntanned and on vacation in Provence. The definition of happiness! Qu’à partir du moment où il se donne. At the very moment it is given. Soyez généreux, donnez-lui le vôtre! Be generous and give him yours! Que celui qui ne peut en donner aux autres. Than the one who is unable to give a smile to others. Traveling with friends is the ultimate treat! What a lovely thought. May your days be filled with smiles to give freely to others! Many travelers love to fly under the radar when exploring a new country. Sometimes being marked as a tourist is helpful, but other times, you want to be seen as just another local. This is the ultimate game to play in Paris, a city known for its leagues of tourists. Feel up to the task of touring France like a Parisian? We’ve learned some tips and tricks to utilize in the City of Lights especially. Try them out yourself on a trip to France with Bliss Travels! No matter how unconfident you are in your French-speaking skills, you should always, always start out an interaction in French. Check out our post on Useful Phrases for Traveling in France for the basics. Just as we would get offended if tourists assumed we could speak their language without attempting English first, so do the French. This is especially common in Paris, where they are constantly overrun by tourists. Give your best attempt and show that you’re trying to make an effort, even if it doesn’t go that well. They will switch to English for you more often than not. And who knows? You may just pass as a local. The French wear tennis shoes when they’re exercising, and that’s it. You certainly don’t have to trek across the city in 5 inch Laboutins, but consider some of your other more understated (but still comfortable!) options. Bring another pair to switch out with when your feet get sore during your trip–they will, no matter what pair you wear. Squeaky white sneakers are the first thing that will give you away! There are endless choices in footwear. Check out one of our past trips who were champs at this! 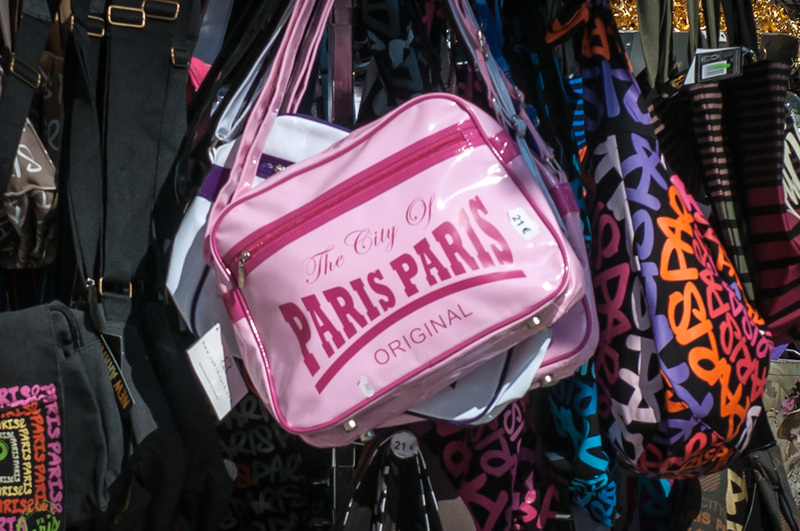 Avoid clothes that clearly define you as a tourist–save the souvenirs for after the trip! Any Parisian cafe, big or small, can deliver an espresso that is to-die-for. The Louvre has gained its reputation as the finest museum in the world for a reason, but that doesn’t mean it should be your only cultural outing. There are dozens of smaller museums dotting Paris, and each is a gem just waiting to be explored. Parisians will oftentimes head to these museums on special days just to enjoy the experience. The Museum Carnavalet, for example, has a stunning inner courtyard that locals will go to for a quiet afternoon of reading and relaxing. La Vie en Rose! The Museum Carnavalet has a lovely inner courtyard to lounge in on sunny days. The French excel at reveling in a moment. While many cultures are more focused on getting as many experiences in as possible, the French have a “quality over quantity” mindset that should be commended. This is one of the biggest markers of a tourist in Paris– we rush through musuems, hustle to the next monument, and grab sandwiches instead of sitting down to a great meal. Take your cues from the Parisians: enjoy your moments and focus on the experience instead of the amount of things you get done. What will make the best memories? Take a moment to enjoy the day, like having a picnic outside! Armed with a carry-on suitcase of neutral clothes and sensible footwear, an adventurous appetite, a guidebook of lesser-known sites, and an open mind, you are now set to take on Paris like a local! These, of course, are just the basics to blending in. Give them a go on your next trip. Bliss Travels specializes in seeing France “like a local,” so why not take the next step and get insider access to this stunning country? Tell us about your own tips to blending in, and we hope to see you on a trip soon! Inside the private collection of the owners of Smith Haut Lafitte, and a tasting of their 100 point 2009 red! Wine tastings are often the highlight of Bliss Travels trips. No one does wine quite like the French, and we fully embrace their talents! Whether it’s a simple chilled rosé at lunch on a Provencal farm or a private barrel tasting with the winemaker in his 14th century cellar owner, or chatting with the technical director of a world famous chateau, Bliss always includes wines! And we treat these events as they should be treated: As relaxed fun! 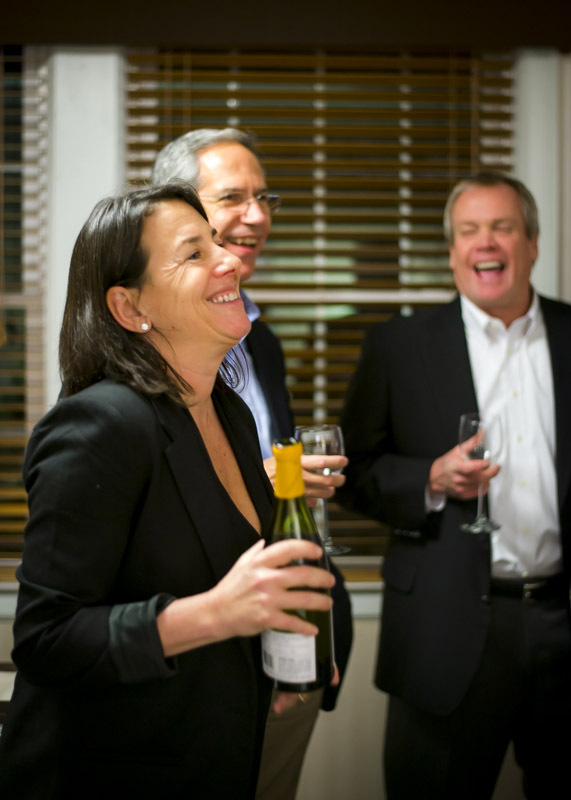 Bliss owner Wendy Jaeger brought fun stories to the evening on a recent trip to Atlanta. Here are a few of our all-time favorites! And to learn more, watch our video of Burgundy or our our 3 minute video of our trips here! Provence offers ancient perched villages, flawless sunny days, and miles of lavender fields. It’s the most relaxing area in France! Owner, Jean Abeille after a private tasting and tour of the winery, led by him. $13.50 per bottle with the 10% discount. Area: This wine comes from a family-owned estate, which is part of Château Riotor, located in the heart of Provence in the commune of Cannet des Maures. The vineyards are only 30km from the Mediterranean, and enjoy a warm, maritime, Mistral-influenced climate. Flavor profile: A delicate and refreshing rosé typical of Provence. Locals (and Bliss, of course) drink rosé at lunch for a perfect midday pick me up. Its gentle flavors reminiscent of fresh peach, clementine, pear and raspberry tend to be on the dry rather than sweet. Pairs well with: soft pink fish, like poached trout. Burgundy boasts of vineyards as far as the eye can see–many consider this the best wine region of France! A trip to world class Domaine de l’Arlot (not open to the public) and a tasting held by their technical director. Not too shabby! Area: This comes from one of the finest Cru holdings in the region, Beaune. Moret is known as one of the premier white Burgundy producers, using detail-oriented procedures to ensure the finest quality wines. 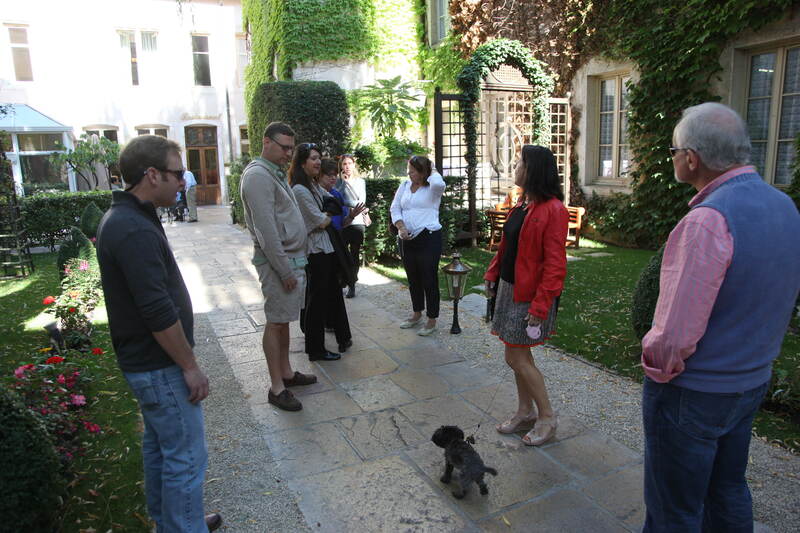 Bliss clients stay in a privately-owned chateau on a vineyard, where we get a private tasting of the wine! Flavor profile: Notes of honeysuckle, toasted walnuts and Anjou pear greet your nose, with rich fruits, lemon zest, minerals and elegant acidity filling your mouth in waves. The finish is long–peeling away the layers before your next sip. 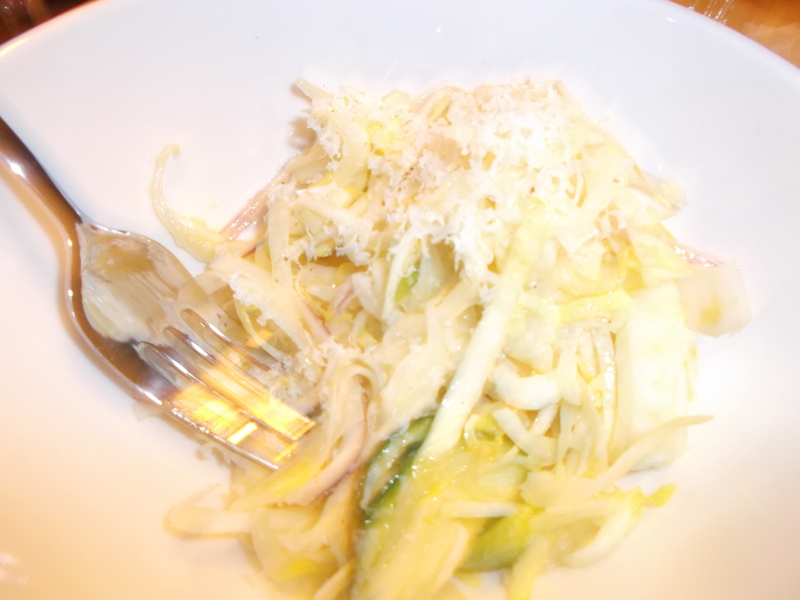 Pairs well with: Epoisse, a bloomy cow’s milk cheese. Delicieux! Burgundy calls to anyone looking for quiet, history-laden Medieval villages and incredible wines. Flavor profile: This vibrant, fruit-forward red has a delicate aroma of red currant, cherry, raspberry and vanilla. Its balanced, medium bodied palate offers notes of ripe red fruit, caramel, vanilla and tobacco complemented by balanced acidity and silky tannins. The Rhone Valley is known for its gorgeous castles and stunning hill views. Grapes: Primarily Grenache grapes, with notes of Carignan, Merlot, Syrah, Grenache blanc, Roussanne, and Viognier. Area: Climate-wise, the area is strictly Mediterranean (the eponymous sea is only 50 miles/80km to the south) and is therefore blessed with a long, hot, growing season, ensuring maximum ripeness for its vineyards. This, combined with the site’s south-westerly aspect, make it one of the most sought-after viticultural sites in the Rhone valley, which explains the density of vineyards in the area. Flavor profile: Spice and fullness. After a few swirls of this dark purple wien, notes of blackberry, garrigue and tapenade come forth. The first sip fills your mouth, full of fruitiness, balanced tannins and acidity with a lasting finish. This is the “Grand Cru” of Vacqueyras. Pairs well with: heartier dishes and meats, such as a good steak. 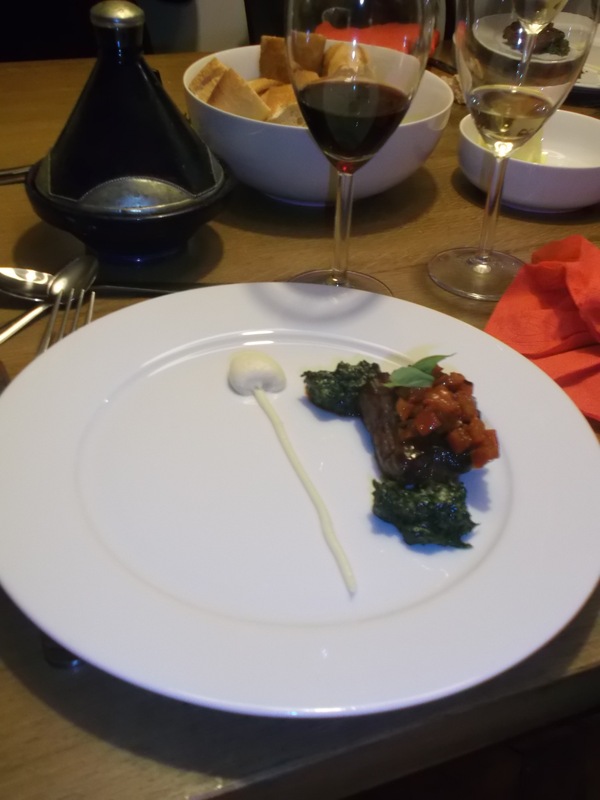 Or, if in Provence –Lamb! Bordeaux is as passionate about its wine as Burgundy! Area: The area produces some of the most sought after wines in France. In fact, some of the vineyards in the area resort to picking grapes with tweezers to get the most “perfect flavor.” These growers take their flavor seriously, as do we! On our trips here, we spend a day making our own wine and have cases shipped home. Bragging rights are definitely earned! Flavor: Aromas of ripe plum, blackberry, and cassis rise from the glass. A little aeration brings out a wonderful balance of berries, plum, and minerality that coats the mouth pleasantly. A short time in oak barrels lends a beautiful silkiness that leaves a full, smooth blend. Pairs well with: lamb in any form, as well as beef. Parfait, non? Now you’ve gotten a good start to a wine tasting of monumental proportions. The next step? Drink them where they were created! Come on one of our “exclusive access, insider” food and wine vacations and visit the vineyards themselves. Make delicious memories! Contact Wendy (wendy@blisstravels.com) to learn more. We have trips to Bordeaux, Burgundy, Provence, Paris and all along the Mediterranean. We have even expanded to Spain! A couple of days in Burgundy are eye opening, mouthwatering, and never enough for a wine lover! This region shows off its grapes like no other in the world. Winemaking has been an integral part of the region even before recorded history, eventually earning it the title of Côte d’Or, the “Golden Slope,” because of the sheer number of rolling golden vineyards in the fall, and the value of the wines they produce. A trip to closed to the public Domaine de l’Arlot with the the technical director –Wow. Not too shabby! We hop off the train in Burgundy (almost regretting leaving our comfortable first class seats) and find ourselves in the charming town of Beaune. Walking down the cobblestone streets, we see the iconic tiled roofs of Burgundy, first designed to replicate the homeland of a noble woman from Flanders that the designer wished to woo. An entire region’s architecture created out of love—just like the nectar we have come to taste! Our little group drops our luggage off at a small private luxury inn, attached to the home of a Burgundy winemaker. 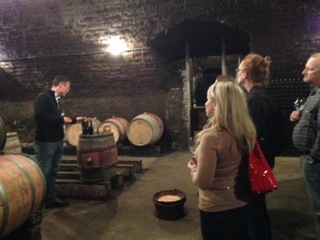 We enjoy a personal introduction to Burgundy as we visit his 14th century cellars, located just under our lodging. This is where we learn the unique qualities and process for making Burgundy wines from the expert himself. We say “unique” because only two grapes represent almost the entirety of production: Chardonnay for white and Pinot Noir for red. The focus here is on the soil and the artful process of winemaking: nowhere else in the world is there such an emphasis on “terroir” and location. What is truly amazing is the variation in flavor that results from these two things. Winemakers here can’t blend grapes (since only 1 of each color is grown), and they can’t blend things grown on different plots of land (or they lose their ranking). “Terroir” is all. 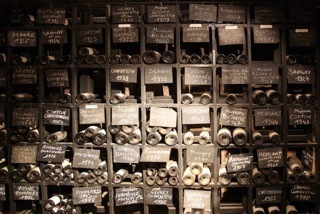 Even the ranking of the wines is determined by which plot of land grew the grape, rather than the winemaker or Domaine. Each bottle bears the name of the plot, each so famous that everyone knows them and what they produce. Everyone in our group eagerly takes in each name to decide on a favorite! Burgundy creates about 180 million bottles per year, but only 2% of these will get the regal ranking of Grand Cru. We taste about 15 Grand Cru –from Corton Charlemagne (white) to Echezaux (red), to Chambertin (red) and the mythical Clos Vougeot (red). The flavor and depth have tremendous variety. Another 12% of production is Premier Cru. These very fine wines are known by their village—Meursault, Puligny Montrachet, Gevrey Chambertin—and the plot of land in that village where the grapes were grown. One of our favorite experiences is tasting a Premier Cru Meursault “Les Charmes” from the barrel. By the end of our 4 day stay, we will have tasted 4 or 5 wines from this very same small parcel of land, all from different years and different wine makers. And, interestingly, we will be able to identify that the wines came specifically from “Les Charmes”—a source of pride for the group. The parcel really does have a distinct flavor, just as different winemakers put their own special mark on each bottle. This is the intersection of nature and art. Burgundy is where we get to taste how they work together—not something we could do if we were in Bordeaux for example. In France’s other major winegrowing region, the winemaker can take grapes from wherever they want, and often mix different grapes (Cabernet Sauvignon, Cabernet Franc, Merlot…) in any way they choose. In Bordeaux you taste the skill of the winemaker, instead of a special plot of land or a single grape. Wine tasting in the cellar is always a favorite memory with our clients! Both regions offer incredible wines and memories for wine lovers. There is nothing like tasting a wine at the vineyard it grew in, and we encourage any enthusiast to put the experience on their bucket list! Tour France; Bliss Travels is the Feature Article in France Passion Magazine! Bliss Travels is so pleased to be featured on the front page of this luxury editorial magazine, which is owned and operated by the French Tourism Bureau! Read the rest of the article right here and get inspired by the author’s musings about our “insider” Provence travel experiences. One of the first bulls to run free in the square on Bastille Day weekend. And that’s “no bull”! One of our favorite meals is outside at a farm overlooking the Luberon valley! Bliss clients also enjoyed a beautiful late lunch in a private walled garden in St Remy before joining the public festivities and visiting Van Gogh’s Provencal sanitorium. We are so excited about our Provence trips this summer. Enjoy 5 nights in the stunning Luberon region of Provence having the benefit of our exclusive access, and then live it up for 3 nights of festival activities or along the Mediterranean staring at the crystal clear water. Enjoy fireworks, bull fights, running of the bulls through the streets, community dances and markets. In addition to the special festival events, this sophisticated town is home to an archeological dig, Roman ruins,Van Gogh’s residence, as well as wonderful boutiques, museums, galleries and sights. Not to mention an abundance of specialty wines and gourmet meals! Our summer trips to Provence are some of our favorites for a reason. Come tour France with an insider! Tour France; Atlanta Has a Wine Tasting to Remember! Sacre Bleu! Bliss Travels owner Wendy Jaeger recently traveled to Atlanta, Georgia to give some past clients a fabulous wine tasting evening. Featured wines came from Wendy’s personal cache and the vineyards that Bliss Travels visits on trips, so clients could “taste” their memories! Bliss owner Wendy Jaeger brought fun stories and years of expertise to the evening. “As we sipped on the wines, Wendy explained where each bottle was from, including personal anecdotes about the vineyards and wine makers. This inevitably led to reminiscing by the folks who had been on tours with Bliss Travels. From the sound of it, everyone who had been on one of the tours had a wonderful time. One gentleman even brought a beautiful book of photographs from his vacation and much time was spent pouring over the pictures and memories. Past clients brought books of pictures from their Bliss trips to reminisce. To read the rest of the article, and see some more of the fabulous photos Morgan took throughout the evening, check out her blog! Thanks for coming, Morgan! We hope to see you on a trip with us soon. Have you ever dreamt of dining in the home of a chef in Paris? Maybe learning his/her secrets? Being treated to a special menu and feeling like a local as you sip wine in his living room, or peak into his kitchen? Of course you have! We all wish we could do this! Otherwise, how else can you explain the stunning popularity of the Food Network and our cult like obsession with “Celebrity Chefs” (all of whom we all know by name, and whose lives and travels we can intimately discuss, as if they were our own family)? Our obsession with all things “food” is based upon our desire to get and insider’s exclusive access to this sort of experience! 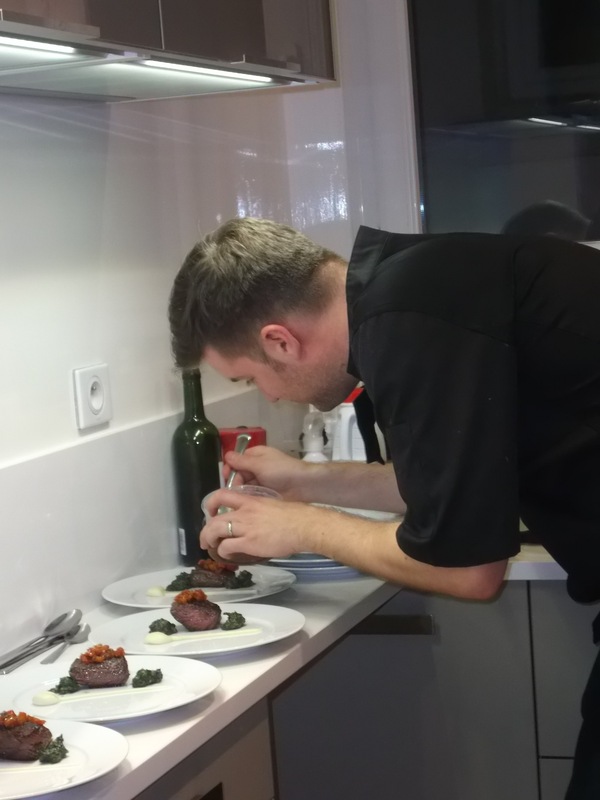 Bliss Travels has had the some extraordinary opportunities to do these sorts of “insider” foodie experiences. Our most recent, and, at the moment, favorite “insider” foodie experience, is our exclusive invitation to the home of a rising Paris chef for a gourmet dinner. We truly enjoyed collaborating with this chef, formerly of Alain Passard‘s gastronomic Arpege, and loved having our clients visit the charming Paris apartment he shares with his wife and little (bien sur) Yorkie. We spent months creating a custom tasting menu and wine pairings to share with our clients. For sure, this will be something we do again and again! Our menu was truly special, as you can see below. An added bonus was the chance to watch the chef plate his dishes and to enjoy them while learning how he made these signature preparations. Here is our menu and some of the food photos of this truly “exclusive” dining experience. The famous Arpege “perfect egg“ was our next dish. I confess that I was so enraptured by the chef’s description of this dish, and dual temperatures of the one egg, along with the taste of this perfectly simple and elegant dish, that I forgot to take a picture!! We paired the egg with our second white, a rich, buttery Meursault Les Charmes 1er Cru, 2009. This was not just a perfect ‘egg’ it was a perfect ‘pairing’! was an intense, non dairy carrot preparation made from caramelized carrots, cooked under pressure and reduced to a velvety richness. The two fold preparation of carrot (one caramelized, the other steamed led to this deep dark color. This dish had no meat and no dairy, and yet tasted richer than any beef based stock I’ve tried. This rich dish led to the last drop of Meursault and a nice transition to our red wines. The Nutella powder was the “dark horse”. Nobody really expected to love that –but he made this using a great trick of molecular gastronomy and turned what is (in my opinion) a cloyingly sweet “kid’s” dessert, into a sophisticated delicious (please, sir, may I have more) end of meal. 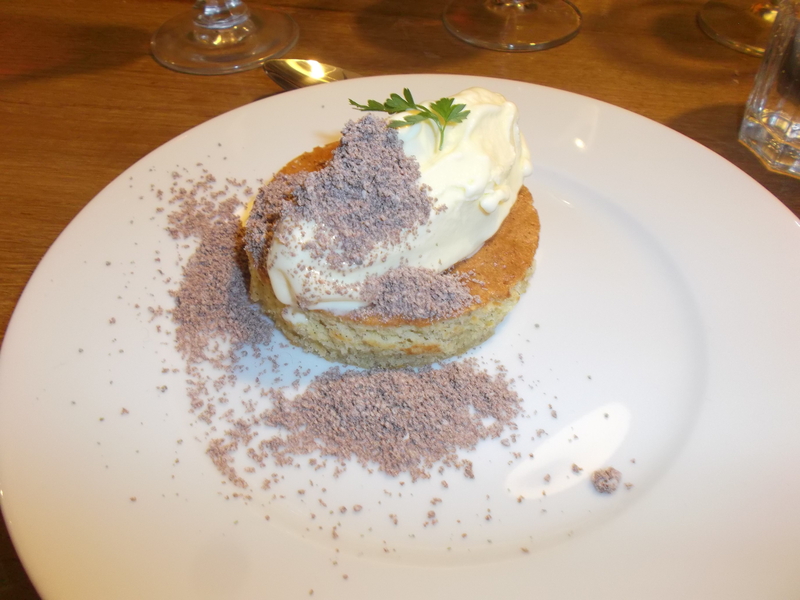 This was served with a fortified sweet wine from the south west of France. Of course, that wasn’t really the end (it never is). We finished with a big bowl of creme fraiche caramels to take home. Yum! An absolutely Bliss-ful evening we intend to repeat with the next group of special foodies looking for something truly unique. Find us on Facebook ..... Or follow us on Pinterest at Bliss Travels! 5 Tips on How to Have it All: The Best of Being Home for the Holidays & Getting Away!